Learning how to thread your sewing machine is one of the most important things when it comes to using your machine in the right manner. The simplest ways to do so is from the user manual which provides directions on how to sew. But there are chances that you might have lost the manual which means you have to search for tutorial lessons mostly online. It is always helpful to start by knowing how does a sewing machine work. Since there are different types of sewing machines it is also important to ensure you have the best sewing machine. There are even sewing machines for beginners which are meant to be used by people who are learning how to use sewing machines. If you feel you are not confident enough you can get a kids sewing machine which has just the basic features. It is also important to get professionals who repair sewing machine in case your machine is not functioning properly. The very first step should be to place the presser foot in the upward position and then putting the spool of thread on the spool holder. The spool holder is located at the very top of your machine and you will be able to see it easily. You should then pull the thread from the spool holder across the top of the machine to one or more thread guides on your machine. When you identify the thread guide you will use you should insert the thread into the guide or guides depending on what you have decided to use. The next step should be to bring the thread down towards the tension mechanism which is at the lower area of the machine. Even if you are using a leather sewing machine, serger sewing machine, heavy duty sewing machine or embroidery machines you will be able to locate the tension mechanism easily. After locating the tension mechanism you should slip the thread between the metal disks and travel back up with the thread. On your sewing machine, there is an area that goes up and down when you turn the hand wheel and it is known as the take-up mechanism. You should place the thread coming from the tension mechanism through the take-up lever. There are some machines which are designed in a way that the thread will slide into the take-up level on its own and in some machines you have to do it on your own. When the thread has gone through the take-up lever it will downwards on the left side of the take-up lever. You should then locate and proceed to thread any thread guides. You should ensure you do this leading down towards the needle of the sewing machine. After reaching this stage you should proceed to thread the sewing machine needle. To be sure that everything goes well you should hold the thread with your left hand and then proceed to turn the hand wheel. To make sure that you have not missed a thread guide you should be on the lookout for any thread that might be flapping around. If you follow the outlined steps you will not experience any problem and you will be able to use the machine as a pro within a short time. In case you notice there is something that is not going well you should take time to practice. This is especially if you are a beginner because most people are usually scared of the various components of a sewing machine. If you are using a sewing machine for quilting you will notice that it has all the components of an ordinary sewing machine. This simply means that regardless of the machine you are using you will need to just follow the outlined steps. After learning how to thread a sewing machine you will get the freedom to use your machine in almost any way you want. To be sure that you do not experience unnecessary problems you need to ensure your machine is in good condition. Repair the machine or get a professional to repair anything that might have a problem. Also, ensure that you have oiled the machine properly so that it can work without problems. It is also important to consider the quality of the threads you are using. The main importance of this is that poor quality threads can result in excess lint in the machine and this will negatively affect the quality of your work. As a precaution measure, it is also advisable to adjust the tension of your sewing machine. If your machine does not have the right tension it will result in irregularities which will eventually affect your sewing. In case you do not know how to adjust the tension it is advisable to read the user manual or request for help from a professional. The sewing machine needle you use will also significantly affect the efficiency of your sewing machine. It is advisable to keep on changing the needle on a regular basis to be sure you avoid problems. When a needle is worn out it will not perform as well as a new needle. Passing the thread through the needle might be challenging depending on your eyesight. To simplify this cut the thread with sharp scissors and wet the end that will be going through the needle. This is helpful because you will not remove the sewing machine needle to pass the thread. While starting it is paramount to start with low speed before you have gotten used to the machine. With time you will be more comfortable and you will know how to balance all the aspects of your sewing machine. 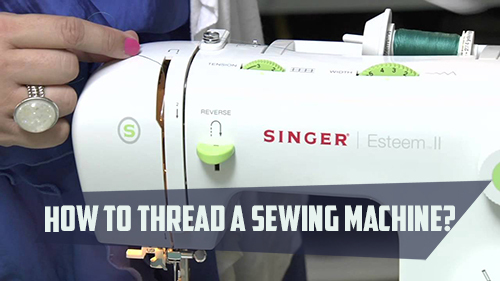 Therefore, by following the outlined step by step guideline on how to thread a sewing machine you can be able to use your machine in a more convenient and efficient manner.